Readers of New Liturgical Movement will undoubtedly have seen (and, I sincerely hope, read) the thought-provoking contributions made by guest author Zachary Thomas during the past year. (These would include “Liturgical Splendor and the Image of God,” part 1 and part 2; “The Priestly Character of Ad Orientem Worship”; “The Eucharist, Sacred Pledge of Civilization”; and “Art as Catechesis in a Baroque Confessional.”) I am well acquainted with the depth and range of Mr Thomas’ thinking, since I had the privilege of teaching him over the course of four years at Wyoming Catholic College, and often find myself wishing he were still here in this remote outpost of the American West, always ready to discuss Latin orations or Platonic philosophy over a cup of tea. I am therefore delighted to announce that Mr Thomas and a number of collaborators have launched a new website, Canticum Salomonis, dedicated to exploring the immense riches of Catholic commentary on liturgy over the centuries and to finding ways to assimilate this treasury of prayerful theology today. As the recently launched Liturgical Arts Journal also demonstrates, we can see in such a venture a promising surge of interest in what our forefathers have to teach us about divine worship, about liturgical ceremonies and their symbolic meaning, about offices, roles, actions, chants, and the whole panoply of material culture that emerges out of and simultaneously reinforces liturgical practice. “The authors plan to provide translations of a wide variety of liturgical materials, especially medieval — translations that are difficult or impossible to find elsewhere. Texts chosen for being clear expression of what our fathers thought and said about the liturgy, what questions they thought were important (or unimportant), and the ways they organized their lives around the prayer of the Church. If by opening windows onto the great ages of the liturgy’s flourishing, we can stimulate the interest and devotion of people today, we will have succeeded. “Occasionally we also publish essays to draw our readers’ attention to salient points about the material in question and invite further reflection. “The polemical purpose is to remedy a certain lack of imagination in Catholic circles. Those passionate about liturgical culture risk getting caught up in all the narrow difficulties of the present. So “traditionalism” becomes preserving the status quo of the 1962 Missal. That Missal as we experience it today in our oratories and parishes is one small gem in a colorful crown of western liturgical patrimony that includes many other rites: Dominican, Premonstratensian, Lyonnaise, etc. And even the way we experience our Missal today — the Sunday High Mass — is only the cusp of a vibrant liturgical life that used to include so many public offices, processions, devotions, even theatrical performances. In addition, whole genres of commentary and mystical exegesis, shedding light on how cleric and laymen experienced the rites, are little known and studied. “To have a full understanding of what liturgy is and can be, and make fruitful efforts for its development, requires knowing it in its full breadth, paying attention to times when it was in fuller vigor. 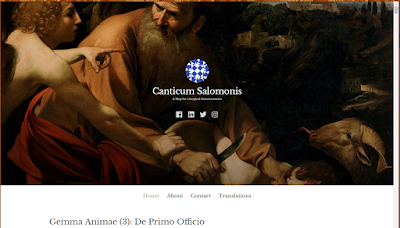 I heartily encourage all NLM readers to head over to Canticum Salomonis. Have a look at the posts already up, and subscribe to it in your feeds, if you use one. NLM wishes Mr Thomas and the other collaborators much success in this new venture!